Forensic Podiatry: Principles and Methods, Second Edition has been completely updated to reflect the latest developments and advancements in this changing field. New additions to the book, from the previous edition, include all new chapters on the expert witness, Frye Test, and Daubert Standard, as well as revised theories on gait analysis, bare footprint identification, and footwear examination. The new edition includes extensive case studies and an international compilation of current best practices. Since this text's first publication, the field of forensic podiatry has rapidly developed from relative obscurity to a dynamic, internationally recognized discipline. Forensic podiatrists have been able to advance improvements in the field, both in widening the range of applications and deepening the practice through improved techniques to strengthen evidentiary conclusions. 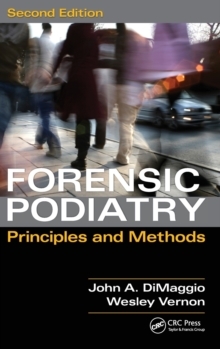 Written by two pioneers in the field, Forensic Podiatry includes over one hundred detailed illustrations to serve as an invaluable resource for students, practicing forensic podiatrists, legal professionals and those new to the profession.